The best thing about turning to Natural Products for your dietary, health or skincare needs is that more often than not, you will find great versatility and great value for money in the products you buy. Convive Aloe Vera Juice is another great example of this. Aloe vera gel is well known for its many, many benefits and the juice is no exception. Try mixing a tablespoon of the juice to juices and smoothies, adding it to your food or simply taking it on its own as a supplement to enjoy a range of health benefits.Used for thousands of years, the Aloe Vera plant produces a clear, odourless liquid extracted from its leaves. Our Convive Aloe Vera juice is nature's perfect vegetable juice, with 200 different nutrients, including 18 amino acids, 8 essential amino acids, vitamins and minerals. It helps to maintain a healthy digestive tract, relieves constipation and trapped wind and can relieve other conditions that affect digestion and the bowels. Aloe Vera Juice is believed to aid the production of blood cells that can help resistance to disease and infection by strengthening the immune system. Because it contains a wealth of vitamins, minerals and amino acids, it behaves like a liquid multivitamin supplement. Aloe juice is widely used as a detox aid and some even believe that it can help you lose weight (although all of my research seems to point to the jury being out on that one). 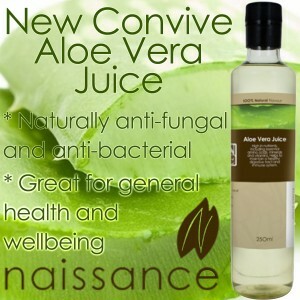 We’ve brought you this great juice to add to your list of healthy must-haves, and the good news is that Convive Aloe Vera Juice does just as good on the outside as it does on the inside… The juice is naturally anti-fungal and anti-bacterial and can be used topically to treat and relieve the effects of sunburn, soothe skin irritations, minor burns, scratches, bites, rashes and stings.